How do all great stories begin? With "Once Upon A Time..." Once upon a time, there lived a king whose heart was heavy. He had been betrayed by the woman he loved. Though the queen's schemes were discoverd before she could deprive her husband of his life, her dying curse killed something deep within him: his ability to love and trust. And so he makes a terrible resolution: He will take a bride for one night only. In the morning she will face a horrible fate. Then he will choose another. Nothing can change his course, until one brave woman steps forwward. 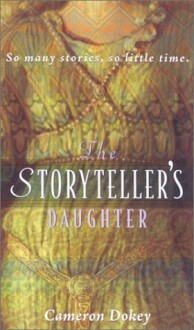 Shahrazad, the Storyteller's Daughter. Steeped in the ancient art of her mother's people, Shahrazad embarks upon a perilous course. With words alone, she will seek to restore the king's heart. As she tells her tales a bond forms between them that neither can deny. But will it be strong enough to hold them together when unexpected danger erupts? A retelling of Sherazad. I picked it up expecting something else, but it was enjoyable. Some magic, mystery and romance, it's a very solid read for a young girl. I've never read the original, but this focused much more on Sherazad's story and her life than it did on the stories she told. Unusual but lovely. It's in an older style so modern inductees into the YA genre probably won't like it. It reminds me of books I read on long dusty car rides in Tuscon so it made me happy. All in all a win!